The EUR/USD has a resistance breakout point at the 1.1425 area or just above there. All forex traders can set a price alert there. When the price alert hits you can check The Forex Heatmap® for a confirmation buy signal. The EUR/USD has substantial upside potential and a new trend should form on the larger time frames above the breakout point, and also possibly on the MN time frame. 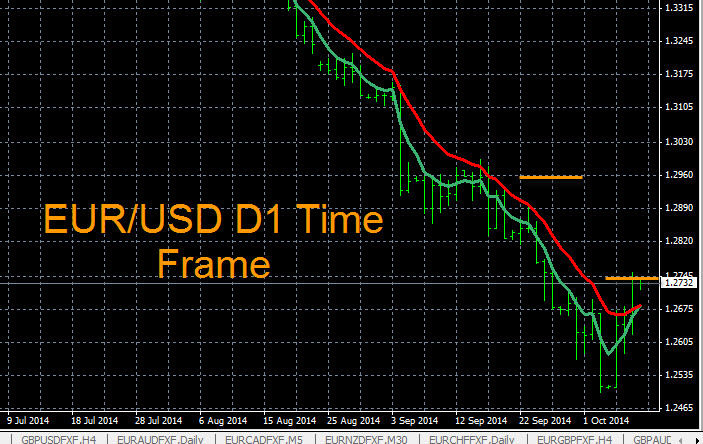 The W1 time frame is pictured below. We use support and resistance breakout points combined with simple trend indicators to plan all of our trades across 28 pairs. 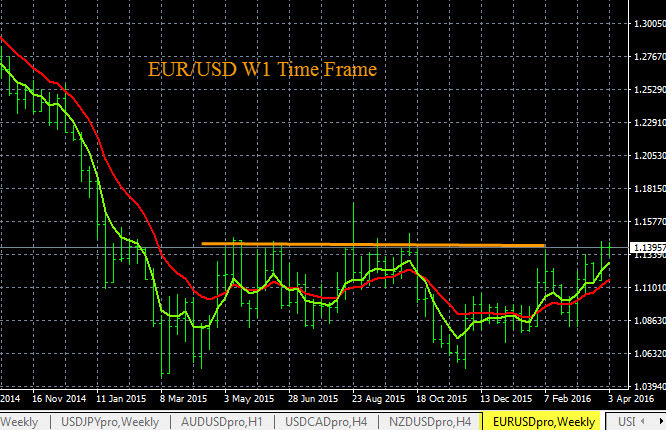 The EUR/USD chart analysis shows that the W1 time frame is trending to the upside. The current resistance level is at 1.1490, you can set a price alert here. When the alert hits check The Forex Heatmap® to verify any buy trades. Past the current short term resistance level at 1.1490 we see no nearby resistance. The overall upside pip potential is considerable on any buys. The chart you see below is a meta trader platform with exponential moving averages. We use multiple time frame analysis for the analysis. Today in currency trading the Euro (EUR) strength drove price movement on all EUR pairs. The EUR/USD moved strongly higher, this pair is somewhat choppy but it is starting a new trend on the D1 time frame, and it has upside potential from here. The EUR/CAD also moved strongly higher, this pair has a strong uptrend in place and should continue to the next resistance at 1.4700. We will continue to write trading plans to buy these pairs going forward. The trading signals you see below are live signals from The Forex Heatmap®, which provides buy and sell signals for 28 currency pairs including the EUR pairs and 7 other currency groups. Today in forex trading the EUR (Euro) signaled some buys on The Forex Heatmap®. THe Euro strengthened across all pairs. Pairs like the EUR/CAD and EUR/USD moved strong to the upside. These pairs are inside of ranges on the smaller time frames and trends, so we would close out some lots or exit both trades completely. The movements were strong but there was no support from the larger trends and time frames. The trade signals you see below are from The Forex Heatmap®, which provides live trade signals for 28 forex pairs. This real time tool guides your short term trades entries or trade entries into the larger trends. Today in forex trading the EUR/USD had a buy signal on The Forex Heatmap®, andthis pair moved much higher. The EUR (Euro) was strong on all pairs and these pairs moved to the upside. The USD (US Dollar) also had some weakness. This pair could form a new D1 trend and continue back up to the 1.1450 area resistance, so we would hold some profitable lots. 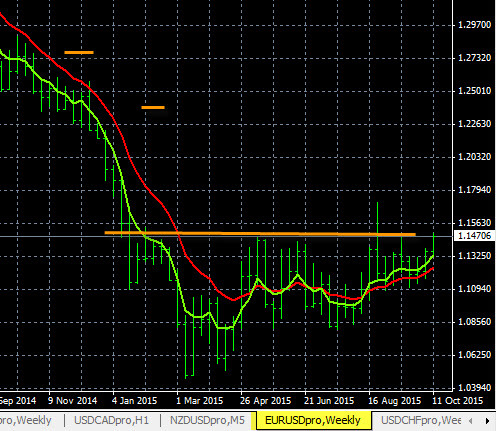 Other EUR pairs broke out to the upside and we will be preparing more trading plans to buy these pairs going forward. The trading signals you see below are from The Forex Heatmap®, a real time visual map of the forex market. Today in forex trading the major pairs (USD pairs) like the EUR/USD had strong movements. The USD was strong on most pairs and the EUR (Euro) was weak on all pairs. The EUR/USD pair had a sell signal on The Forex Heatmap®. This signal is shown below. This pair dropped to the downside along with several other EUR pairs. The EUR/USD is trending down on the higher time frames. We only see one more support level around 1.1150, then below there is has considerably more downside. We will look to continue to sell this pair in our trading plans going forward. Our trend based trading plans and live signals work on seven major pairs and 21 exotic pairs. The EUR/USD has been in a down trend, but is rebounding off of support and could continue higher. The current resistance level is at 1.2750, noted by the yellow line. You can set a price alert here. When the alert hits check The Forex Heatmap® to verify any buy entries. The next resistance area is around 1.2950, so this trade has 200 pips of potential. The overall trend is still down on the largest time frames is still pointing down, so treat any buys like short term trades for now. This pair could continue up for a few days. The trend analysis you see was done with multiple time frame analysis on the (Euro) EUR and US Dollar (USD) pairs.